The boys’ basketball team, the fourth-ranked team in New Jersey, has rebounded nicely after its tough 49-48 loss to fifth-ranked Bergen Catholic on New Year’s Day. Since their first loss of the season, the Knights have defeated three-straight one-loss teams. Gill got back into the win column on January 8 by beating Hunterdon Central 63-45. 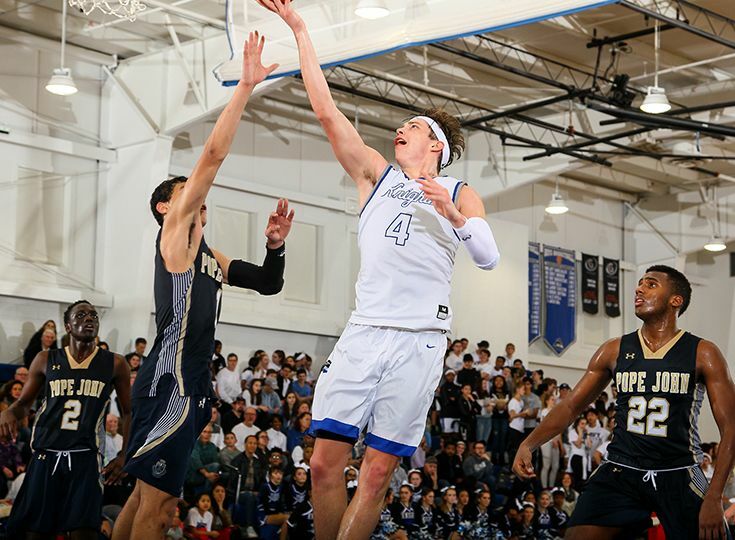 Paul Mulcahy ’19 led the way with 24 points, 11 rebounds, and seven assists. Will Soucie ‘20 also had a big day with 15 points and eight rebounds. The Knights kept up the momentum as they went on to defeat a tough Montgomery team by the score of 59-49 on January 10. Mulcahy recorded a triple-double with 15 points, 11 rebounds and 12 assists. Also having strong games were Zach Martini ’20 who scored 15 points and had 13 rebounds and Denver Anglin ‘22 contributed 14 points as well. Gill closed out the week with a 55-48 victory over Christian Brothers Academy on January 12. Mulcahy narrowly missed having back-to-back triple-doubles as he scored 20 points and had 11 rebounds and nine assists. Martini recorded his second-straight double-double by scoring 14 points and having 11 rebounds. The Knights return to the court on January 15 when they take on Bridgewater-Raritan.